For the 5th spot on my Los Angeles Cupcakes Meetup group we visited Yummy Cupcakes in Santa Monica, just across from the 3rd Street Promenade and near another cupcakery, Vanilla, which we attended two meetups ago. 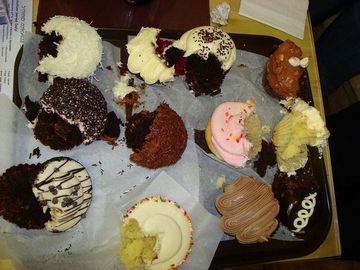 We eagerly tried Yummy's cupcakes to see if they live up to their name and happily found that they did. I think it is now in our top three LA shops so far (Susiecakes, Dainties and now Yummy). Zendi, our group's photographer and red velvet taster raved about their cocoa red velvet cupcakes and I enjoyed their special rocky road cupcake complete with nuts, marshmallows and chocolate whipped frosting. Their trademark Yummy Cupcake with chocolate cake and pink butter cream frosting and chocolate sprinkles was a popular favoriteamongst the group too. What I loved most about this unpretentious shop is that it has a lot of unusual flavors, 125 to be exact. They have about 10 of their regular flavors always available like Happy Day (vanilla), Yummy, etc. and then four different varieties for purchase each day like Pink Lemonade, Chocolate Raspberry, Peanut Butter and Jelly, Rocky Road, etc. All are baked from scratch every morning and all day long by their talented pastry chefs who hold the prestigious Le Cordon Bleu diploma. 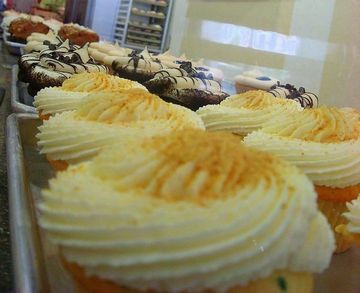 According to their site their cupcakes are made using top quality real ingredients such as whole milks, creams and buttermilks, Callebaut chocolates, fresh fruits, juices and zests, California creamery butter, Madagascar Bourbon and Tahitian vanilla bean and ranch fresh eggs. No lards or trans fats. They also have a shop in Burbank. 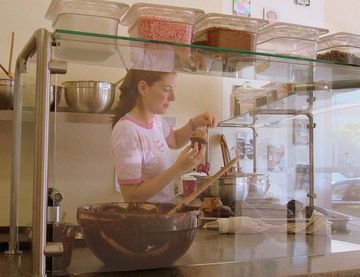 The owner Tiffini Soforenko came out to talk to us and turns out she the recipes are hers and that she owns the shop with her mother and husband. The store is also very kid-friendly with little chairs and tables that can be rented out for cupcake decorating birthday parties--too cute! I want one, is what I was thinking. They are also going to be adding a make your own cupcake sundae bar, where people can, yes, make their own cupcakes and pick cereal toppings, etc. For more photos check out the events page here. You can find countless fitness equipment at a fine exercise equipment store. The treadmill is the best equipment at home for working ladies and older people, using this daily can keep you very fit and active. While exercising you should have a water bottle with you. Besides using trampolines for exercise many children use if for fun and playing. Various expensive but best exercise equipment sale deals are offered on different websites for gym owners and people with special fitness interest. The hubby brought us some Yummy cupcakes when he was up in L.A., and I LOVED the Yummy Yummy! MMMMMM...cupcakes. I feel like I've transformed into Homer Simpson with that one word. He loved beer and donuts and I am crazy about cupcakes!! !